Our protagonist hero from the first book, Professor John Matherson, continues to have his hands full in the sequel trying to rebuild his small North Carolina enclave. The winter was not kind and took the lives of many in the community. He is constantly under attack by neighboring gangs and has built a small militia from the able bodies in town to protect their supply of goods. When the federal government establishes a presence in the nearby city of Asheville, it would appear that hope is on the horizon. Unfortunately, Matherson’s goals don’t align with those of the regional commander. As you would expect things quickly degrade from there. One Year After is a a well written, fun, interesting read as a follow-up to One Second After. It doesn’t introduce any new concepts or facts related to the technical aspects of an EMP attack. Instead, it highlights the emotional toll of living through months without the basic luxuries of modern society that we take for granted these days like clean running water, electricity, refrigeration, transportation, and more. The emotional toll is especially high when there isn’t any indication of when these modern luxuries will be restored, or if they ever will be. As sequels go, I enjoyed the book. I couldn’t put it down and finished it over the course of 3 days, which is quick for me. 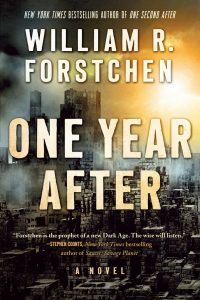 What I really like about the book is that Forstchen has done a great job putting together a realistic look at a post apocalyptic version of events. While some stories can go over the top, or not stick together well, the events and characters that Forstchen portrays are very well done. If I can nitpick, and I will, my only beef is the predictability of the plot. It’s very formulaic and a bit cliche. Our hero figure is under attack by the faceless government bully. You know how it will turn out while reading it, the biggest question is just trying to figure out how it will go down. Otherwise, the story is great, and you can’t help but root for the underdog who is very likable (at least in my opinion). All in all, given how much I liked the first book in the series, I’ve put One Year After on my Must Read list. I’d suggest reading them back-to-back if you haven’t read One Second After yet. I’ve also put the third and final book in the series, The Final Day, on my reading list and hope to get to it during 2018. Most important of all, given how plausible an EMP attack could be given today’s geo-political environment, Forstchen’s work will at least raise awareness of why we need to take such a threat seriously.